Here’s a challenge to the rest of our LOOP Venture teams: Reima Play just broke all the records for fastest time-to-market! Admittedly, they had done a lot of pre-work, studying benchmarks and creating first hypothesis of the newly launched Reima Play service before the Play team really started working together. Nevertheless, in the beginning of January we were still deciding on some of the core guidelines of the service and managed to get first paying customers on the first days of March. That’s quite the speed for entering a market with a new business model. Furthermore, the first release of the service exceeded a lot of its goals from conversion rates to customer demand. This is a great start to keep working, validating the service with customers! In a recent retro for our first launch, the team – a combination of Reima experts and external support, including LOOP Venture builders – felt unanimously that the secret to exceeded results was good communication and clear goals. “We all knew what had to be done and did it. Not once did anyone have to double-check if something was done, it was simply done” we agreed. The team had a clear focus on tasks and their priorities. With very little management and extremely light documentation, we managed to deliver what we needed daily, week after week. The first release of Play was a true test of “Lean Corporate” methods used in LOOP Venturing. A way of delivering like a startup while reporting to regular corporate governance and delivering quarterly value. Not an easy task to achieve, but something we now feel certain can be achieved in all of our LOOP Ventures. Reima Play is a service for parents with small children, helping them buy the top-tier outdoor clothing hassle-free. In Reima Play, customers subscribe to a monthly fee, fill in information about their kids and receive automatically the right set of clothing throughout the year. Packages vary from overall only to full set of gloves, shoes and mid layers. Reima Play also helps parents re-sell the used garments, eliminating yet another cumbersome task from families’ daily chores. 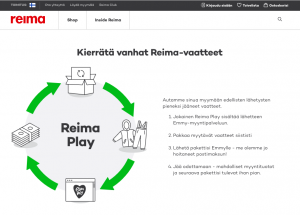 Reima Play is a case of moving towards a Product-as-a-Service model. The vision is to achieve a circular business where the clothing is all returned to Reima, enabling reuse, recycling and re-manufacturing of the clothing. 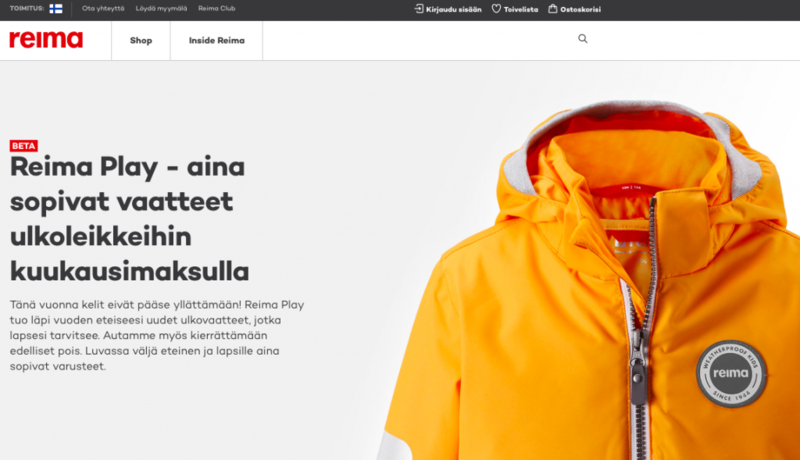 In the first released version of the service Reima validates the customer need for an annual service to support families in the chore of clothing their children for some real outdoor fun. Next, recycling and refurbishing by Reima’s partner Emmy, emmystore.com, will be explored. There are still a million things to solve, but for now Reima seems to have found real customer interest and we will continue the good work to make the service even better – together with the first pilot customers. If this is the result of first eight weeks, what will be showcased after three months in World Circular Economic Forum 2019? Stay in the LOOP to find out! Images are screenshots from Reima Play in March 2019.